Poem of the Day, April 25: A Dozen Reasons to Give Up Haggling over the Price of Weavings, Roseann Lloyd | Welcome to the new Journalverse! Because of the Light is by my poet-friend Roseann Lloyd, who I met through her wonderful book co-authored with Richard Solly, JourneyNotes: Writing for Recovery and Spiritual Growth. 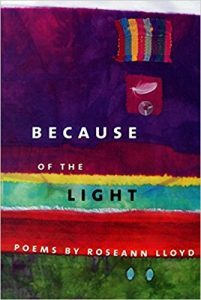 In this collection, Roseann enters the lives of people on several continents, then creates poems that balance and juxtapose northern and southern light; lyric joy and reports of injustice; myths and stories, told to her by people she met on her travels. In poetic forms from western and eastern traditions—such as the ghazal and the prose poem—she writes of love, poverty, beauty, work, children, war, the life of the body and the spirit. Roseann Lloyd received a Bush Foundation Fellowship in 1999 and the Minnesota Book Award for Poetry in 1997 (War Baby Express, Holy Cow! Press). She has published one other poetry collection, a translated novel (Seal Press) and co-edited Looking for Home (Milkweed Editions). She currently teaches at Augsburg College in Minneapolis, MN. (c)in the name of the poet or assigns. Used for educational purposes and for the promotion of the poet and enjoyment of the reader. Write a list poem called “A Dozen Reasons to —-” (fill in your own blank).